By Yang Siqi (17A01C) and Nerissa Loe (17A13A). Photos by: Raffles Photographers. 3 4 5 11. Colourful chalked words all around the school’s hotspots revealed the dates of the Players’ latest production, ‘Where to Find’. The production featured three carefully chosen plays that were both touching and chilling, bidding us to look beyond the superficial. They reflected the the overall theme of searching: for something, be it forgotten family ties, a life beyond death or even for memories. The night began with Players’ excellent adaptation of ‘Mama Looking for Her Cat’ by Kuo Pao Kun (1988). In the play, we met Mama and her five children. In the beginning, they conversed merrily in Cantonese, the children crowding around Mama to listen to her story of the frog in the well. 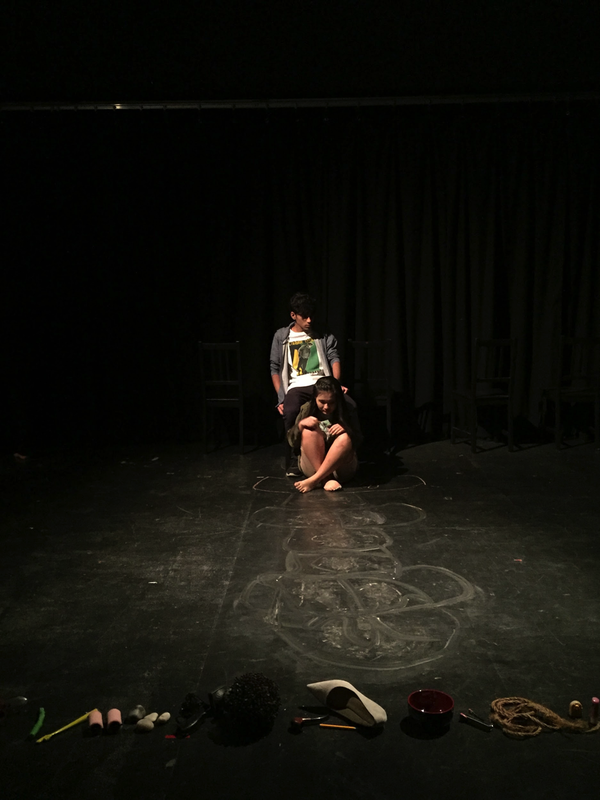 However, as the play continued, it showed how the children had all grown up and were living busy lives away from their mother. This, however, led to their neglect of her. Subject to long bouts of loneliness in her home with no one for company, Mama then made a friend in the form of a black cat, confiding and taking comfort in it. When her cat disappeared, Mama tried to look for it, even venturing out of her house and into the neighbourhood, something she did not often do. Perhaps Mama left the house to find the cat, or perhaps she did so to escape the stale memories of happier times – whatever the reason, she did not return home. Upon hearing the news of her disappearance, the children were disbelieving. 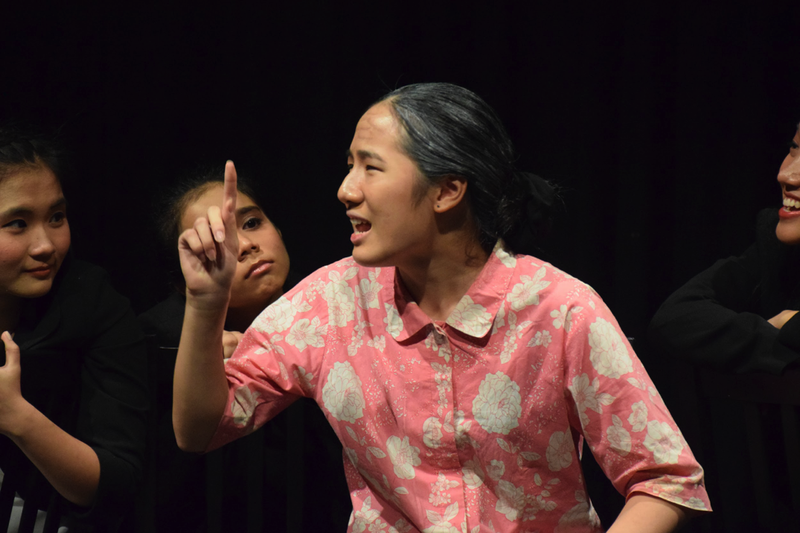 Her only son (Tham Jia Yi, 17A13A) contemptuously exclaimed that ‘you can’t teach old dogs new tricks’, assuming that their mother would never leave her home because her home was all she had ever known. They were quick to blame their mother’s sole source of comfort, the neighbourhood’s stray black cat, for causing her to wander away. The anger they felt towards the cat for taking their mother away (and for demanding their time to look for their mother) built up to a frenzy. While her children were looking for Mama fruitlessly and with mounting frustration, we were treated to a more light-hearted conversation between Mama and an Indian woman she met, who was also looking for her lost cat. Initially, the two of them were completely unable to understand each other as they had no shared language between them. However, through an immense effort, they found an effective way of communication through hand gestures. They were even able to establish that, while the Indian lady’s cat went ‘meow-meow’, Mama’s cat went ‘miu-miu’, much to the amusement of the audience. The two part ways after the lady found her lost cat. The connection between Mama and the Indian lady showed that though having no common language could be a barrier to effective communication, as long as both parties were willing to try and comprehend each other’s innermost thoughts, a mutual understanding and even a shared respect could be reached. Contrast this with the children’s cold attitude towards their mother, and you would see that language was not the real culprit for their increasingly distant relationship, but the children’s loss of respect towards their mother. However, as the scene of heartwarming connection closed, the flurry of anger from Mama’s children recommenced. This built up to a climax when, upon finding Mama’s lost cat (here depicted as a stuffed rag doll), they ripped it apart. This dramatic action was perhaps symbolic of man’s need to exact blame on another, whether or not it is justified. Mama’s children were unable to accept the fact that their mother’s disappearance was not because of the cat, but because of their own neglect. While Mama had given them all her love, they were unable to ever return it. This illuminated a tragic relationship between the parent and the children, where a parent’s love failed to reach their impatient, distant children. They could only watch as their relationship grew increasingly distant and frigid. 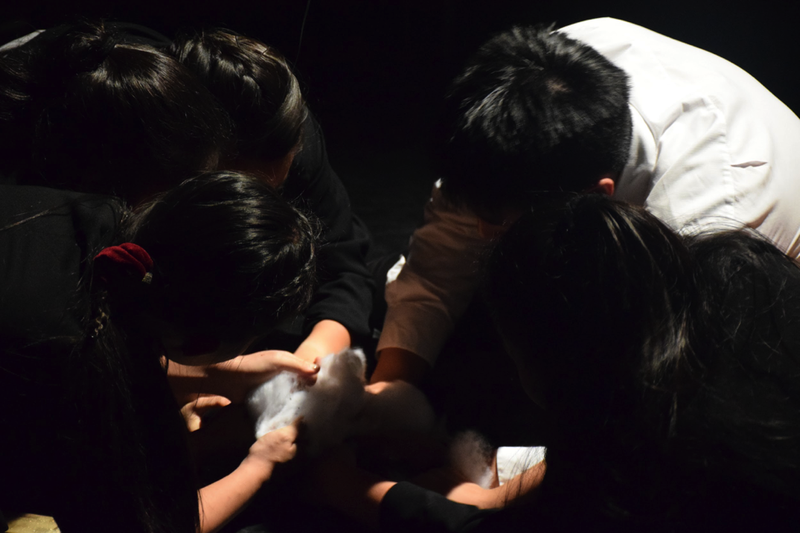 The last scene of Mama tenderly cradling the remnants of the black cat was indeed heart-wrenching, bidding us to feel sympathy for the old woman, now left with nothing but an illusion of companionship. 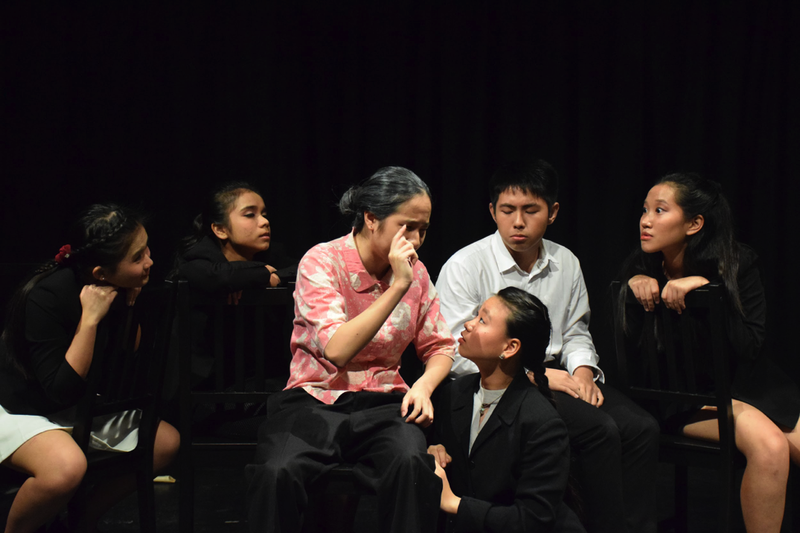 Here, Alison Tan’s (17A13A) portrayal of Mama shone as a truly commendable effort in effectively depicting Mama’s sense of displacement and intense desire to love throughout the play, stirring feelings of sympathy in the audience. 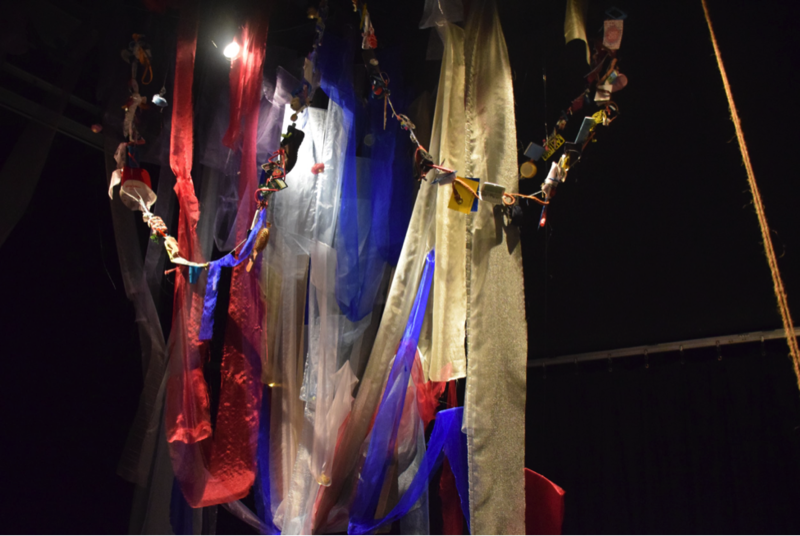 What stood out about this play was definitely the ensemble work – even when the focus was on Mama, we could still see what the other characters, her children, were doing. This further accentuated the barrier between Mama and her children – while she frets over the health of her children, they went about on their daily lives, barely sparing her text messages a glance. This definitely helped the play seem more genuine as Mama’s worry was contrasted with her children’s indifference, highlighting both emotions. 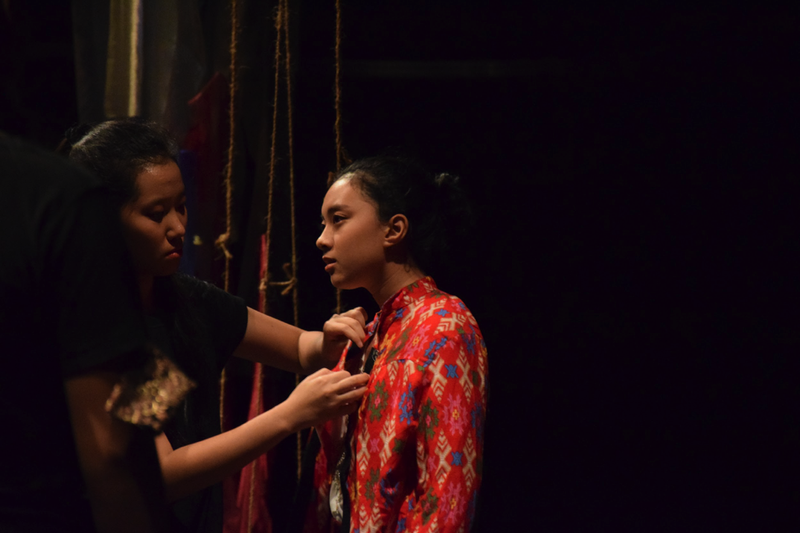 A seamless transition brought us to the second play, titled ‘Marco Polo’ by Jovi Tan (2014). 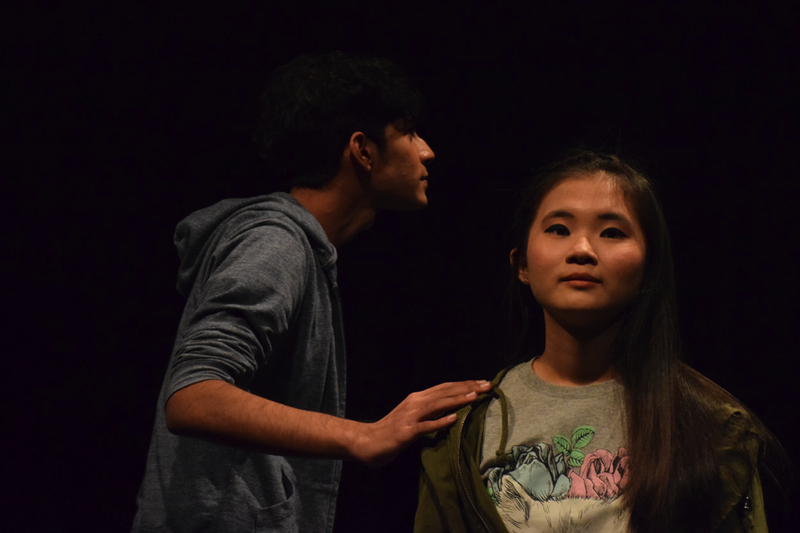 This suspenseful two-person play between Lim (Hu Yunting Grace, 17A13A) and Jackson (Sabariesh Ilankathir, 17A13A) kept the audience at the edge of their seats as they wondered what would happen to the characters in the end. In the play, two blind characters arrived in a void which, to them, appears infinite. Bewildered, they started to wonder if this is the afterlife and, critically, whether they have arrived in heaven or hell. Jackson appeared more frantic about this issue, wishing for this to be heaven, while Lim seemed rather apathetic about the issue. This tension was interwoven in their exchange as they slowly began to roam the space. The play’s namesake, the game of Marco Polo, became a way for them to ascertain their distance and to find each other as they separate and walk around the space. This play was rather absurdist in nature, which might have left some of audience slightly confused, as were the two characters at the start. One thing, however, was for sure – the sweetness of their friendship, of finding a comrade (both blind! What are the odds?) shone through in the face of their uncertain, ominous position in the uncertain afterlife. One of the play’s greatest takeaways, perhaps, was of man’s ability to adapt, even in the most absurd of situations. Alone, their strength was limited – they may never have left the purgatory. Together, they were able to gather the courage to seek out a certainty beyond death, as uncertain and unattainable as it may be. This writer’s favorite moment was when Lim played hopscotch in the play as she continued listing the different ways she could commit suicide. As Lim had been walking around, a cast member with no speaking lines had rolled a piece of chalk over to her which she used to draw the boxes and play with. It was interesting to watch Lim become increasingly trapped within the hopscotch as the chalk was wiped off bit by bit. This play was certainly the most abstract of all the plays but was very intriguing as well because the tension continued to rise as she finished listing her ways to die while becomingly increasingly trapped. In the end, when only one box remained, she could not step out of the box. She had been trapped and any efforts to try to step out of the box resulted in loud beeping sounds that warned her against it. This served to remind the audience that these characters are actually trapped even though they are in a seemingly infinite space, as they do not know if they are in heaven of hell, and where and how they can escape the place. 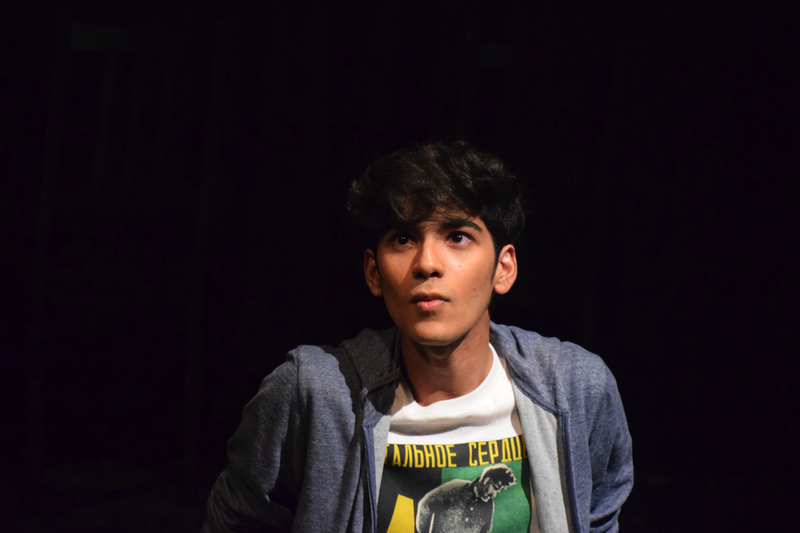 With a unique premise and good acting (with particularly commendable portrayals of blindness and excellent chemistry between the actors), the writer feels that this play had certainly been rehearsed and executed well. After an intermission, the third play began. 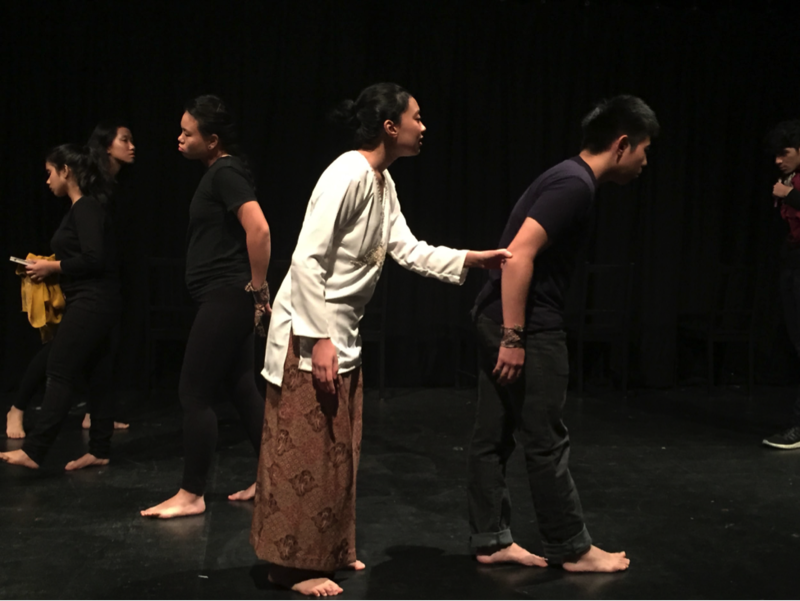 ‘Sampan’, written by Muhammed Izzul Irfan (2016) was a monodrama. It was a story of an Indonesian lady, Jenab, and Yang, her great grandmother. Jenab had been lulled into monotony and domesticity of her everyday life, yet began to recall events of her great grandmother, Yang, who made an arduous voyage from Pulau Bawean to Singapore and faced numerous hardships along the way. What was most interesting about this play is that a single performer took on the role of two characters. Perhaps the reason for this was to juxtapose the inaction of Jenab against the decisive actions of Yang. 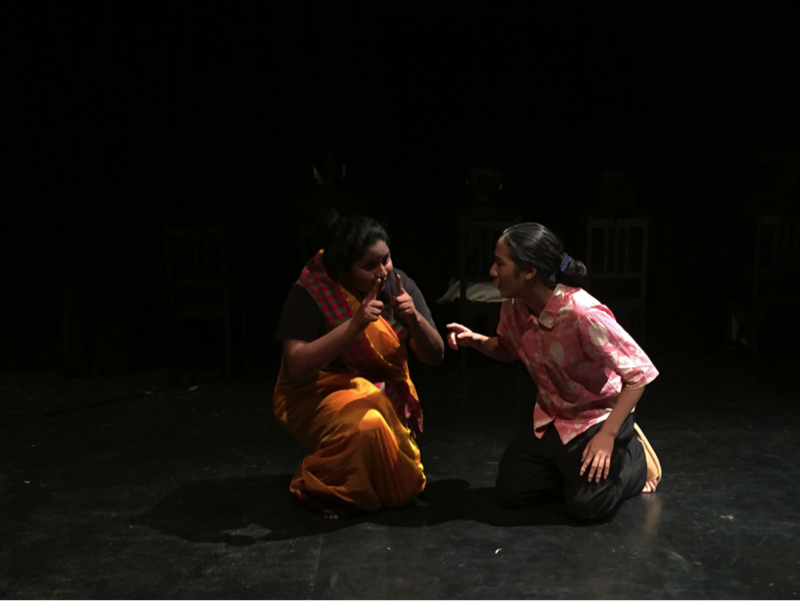 In the play, Jenab displayed extreme disapproval towards the actions of an “ah moi” who stood up the grocery line for a long time, and had indicated her wish to move things along several times. She wished to tell the lady to hurry up, or to ask the cashier to let her check out her own items first. However, what’s important is, she did not. She did not do either of these things, and had instead stayed where she was and allowed herself to be held up, despite knowing that she had an appointment later. Thus, her passivity is shown even through this simple incident of grocery shopping, betraying her weak-willed nature. While Jenab, content with her glib tongue and a stagnated life, Yang was different. Yang preferred to take action, rather than relying on words to mask her flaws. Yang had taken it upon her own hands to change her fate, even if it meant giving up the most familiar of things in her life. 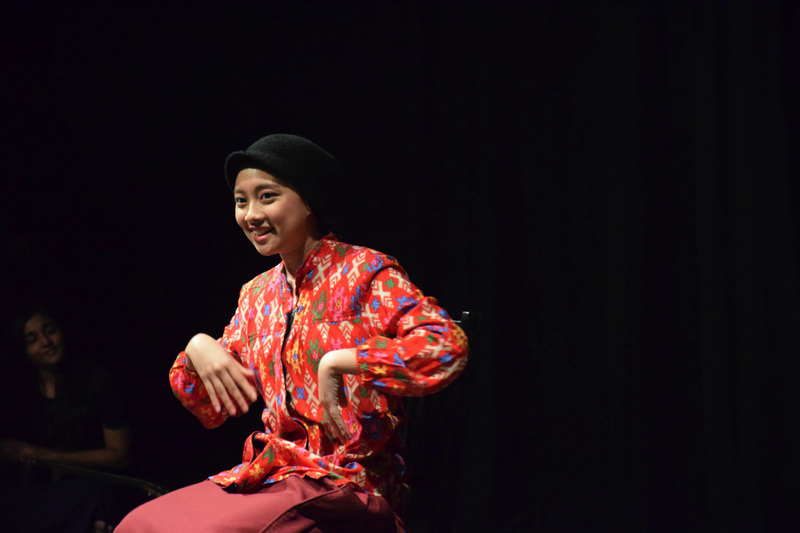 The contrast between them ties in with the title: while Jenab simply floated in the figurative sampan, Yang made use of the sampan to give herself a new future. A possible flaw to this play was perhaps the drastic change from a comedic scene to a dramatic one. Jenab made fun of everything around her, drawing the audience in with her antics and pulling off the role of a carefree housewife with great ease. However, barely a sentence later, the audience faced Yang, rowing a boat with increasing desperation with no sight of the island Singapura and singing a song that tugged at their heartstrings. The transition was jarring, yet perhaps it greater emphasised the difference between the two characters. 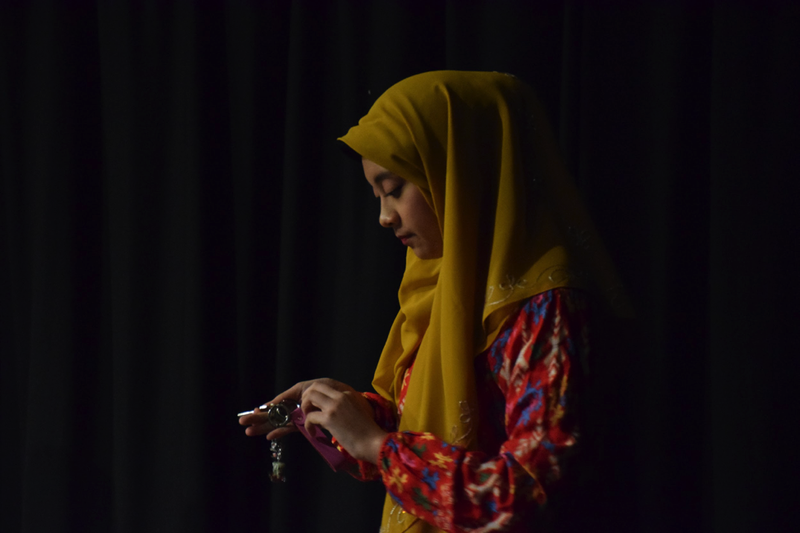 Mahirah bte Abdul Latiff (17S03B) played both Yang and Jenab. 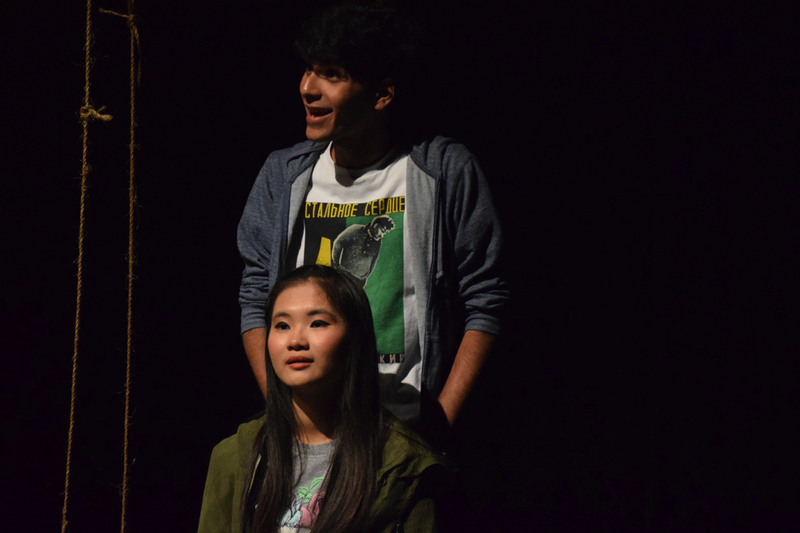 She was able to channel both Jenab’s comedic, witty and lighthearted interactions with the audience, as well as Yang’s distress of finding herself stranded on unfamiliar terrain. This made the play an enjoyable and superb conclusion to the production. 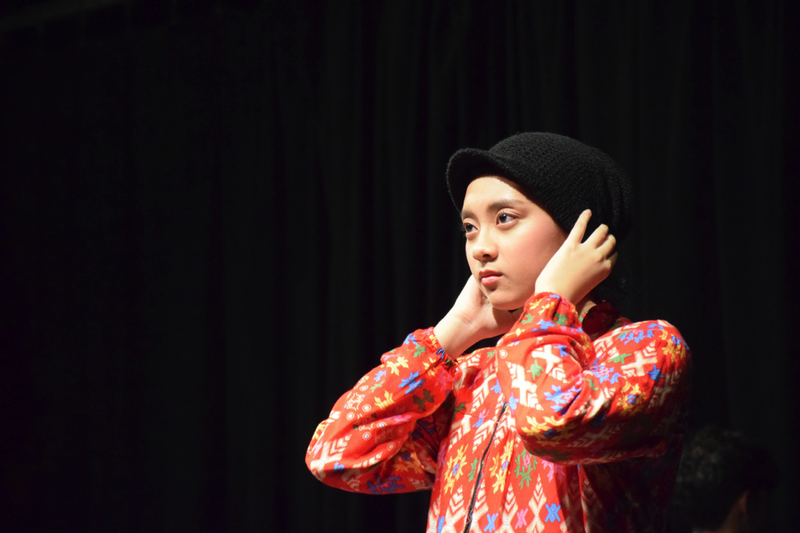 All in all, Raffles Players shone once more with this production. The play was definitely well-received, with sold out shows for all 3 nights. The Players’ immense effort and nearly flawless execution of the plays definitely did them justice. 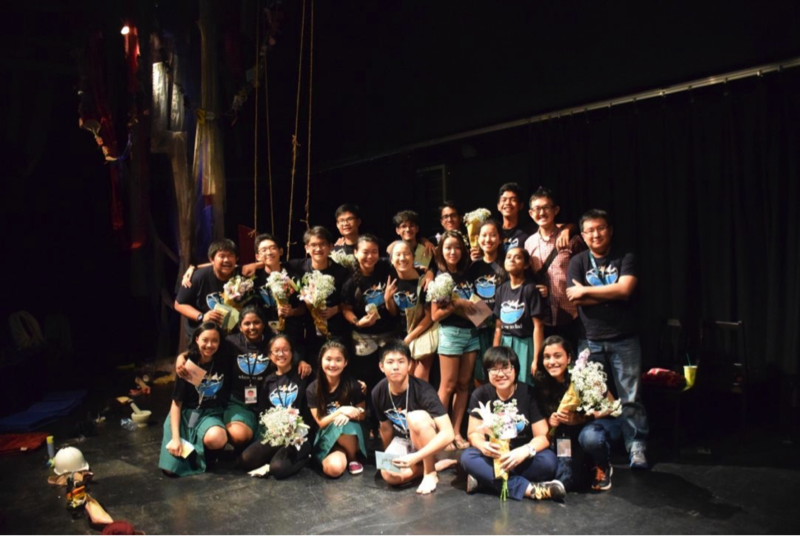 Raffles Press would like to congratulate them on another wonderful performance!